How is it that you guys came to be working in the Alps doing what you do? We moved out to the Alps in 2003. There are personal reasons behind our move out here but in professional terms Jamie was ready to make the move from being a guide employed by other companies to setting up his own company. His cousins had a chalet in Morzine and he had made a few trips out here to ride so he knew the wider area and was really impressed with the trail network. I got a posting to Geneva with my job at the time, we moved out here full time and Ride the Alps was born. 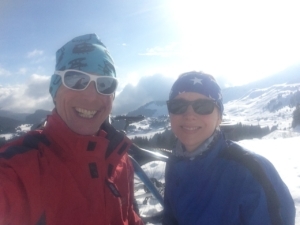 We are now based in Morillon in the beautiful Haute Giffre valley where the trails are not so well used as they are in the more popular Alpine resorts. What did you do in a previous life? Because they looked like so much fun! And because we wanted to develop a winter season for our business. Our summer season always fills up very quickly and it’s a super-busy time for us. Our winters are relatively quiet. Jamie does some snow shoe guiding and igloo building but we were looking for something he could develop a real passion for in the winter and we came across fat bikes. Do you ride any other types of bikes? When and why? Absolutely! We love all things bike-related. During the summer season (May to mid-October) we ride our trail bikes. Jamie rides an Orange Alpine 160 and I ride an Orange Five. A lot of our summer trips are point-to-point high mountain routes with a lot of technical riding. You can find out all about our trips here. So tell us more about your tours/packages and what you offer? What age groups? From fit and able teenagers to old-timers. So long as you have the fitness and skills to ride you’re very welcome on any of our trips. Is it more for individuals, groups of friends, hard-core cyclists or families? We can tailor some of our trips to suit the needs and abilities of our guests. For other trips you need to be an experienced and technically accomplished mountain biker. We do a couple of family trips each season. Almost all of our trips are with private groups of friends or families. 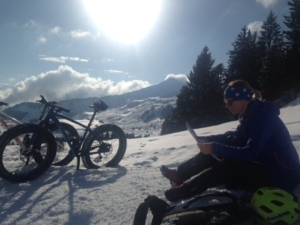 For fat biking trips we can take novices and expert mountain bikers. There are trails to suit all levels. Jamie guides people down powder runs, up to mountain refuges but also along the scenic river valley trail. Do you guys offer airport transfers? Yes, we work with a local airport transfer company & can help to arrange this. For fat biking any time from December to April. Snow conditions vary throughout the winter season but the best conditions are usually in January, February and early March. We can always find somewhere to ride on the fat bikes. One of the great things about them is that we don’t need perfect snow to be able to ride. For trail biking it’s May to mid-October. 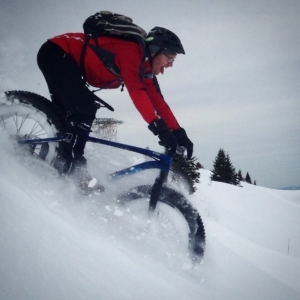 Do you have to buy a ski pass to go fatbiking? No. In fact in our area the fat bikes aren’t allowed on the lifts. We are not strictly allowed to ride on the pistes but often a piste will be closed because the snow isn’t good enough for skiing but it’s perfect for fat biking and then we can take an uplift and have a fast blast down! You can also sometimes do this at the very end or the very start of the day when there are no skiers around. Otherwise we use hiking trails, which are permissible for bikes. What fatbikes do you have on your fleet, can people bring their own? We have Specialized “Fat boys” and Jamie guides on an On One “Fatty”. Yes, you can bring your own fatty. You can also rent e-fatbikes if you want to take the effort out of the ride! Do you offer servicing or have a workshop in-case anything goes wrong with someone’s bike? What else is there to do in the area where you’re based? So much fun stuff to do in our valley! In the summer: Trail running, hiking, rafting, kayaking, paragliding, lake swimming, climbing, via ferrata and more! In the winter: Skiing, snowboarding, cross country skiing, ice skating, igloo building, snowshoeing, husky dog sledding, ski joering etc. If you want a less active stay there are mountain spas, beautiful towns and villages to visit and boutique shopping on offer. There you have it folks, if you’re a regular visitor to the French Alps and you’re looking to spice up your trip, defo consider booking a fatbike trip with Jamie, our fatbike voucher might even be a great stocking filler in a just over a week’s time. The prices are reasonable but vary depending on the: number of people in your gang (4-6 is best). Pricing is set to include airport transfers, B&B accommodation, fatbike hire & 2 days of guiding. You will of course need to sort your own flights to Geneva, but fear not Aer Lingus fly direct from Dublin once a day and flights are also well priced. Please get in touch with us at info@fatbikeadventures.ie for more information. Check out our interview with Mary & Ride the Alps we did earlier in the summer here. Take an Irish summer with hot and uncannily dry weather. Add a dash of adventure and some world class organising. Then whack in a healthy dollop of top notch sponsors, aka 53 Degrees North, together with a massive lump of like minded thrill seekers. And voila! You have the recipe for the super deadly 53 Degrees North Adventure Festival… the likes of which has never been seen on the Emerald Isle…ever. This past weekends’ 53 Degrees North Adventure Festival on the lakes in Blessington, County Wicklow was unquestionably “dadventuring” heaven. ‘Dadventures’ is a hashtag/phrase we’ve been using of late and it is pretty much what it says on the tin. Sure, where else would you and your kids get to try throwing an axe, some archery, biking, hiking, kayaking, SUP boarding, yoga, slack-lining, camping (with some epic adventure films), good solid nosebag and some bodacious local craft beer (over 18’s only please drink responsibly) all in a single weekend … without having to re-mortgage the gaff. Our Switzz Bikes electric fatties were a massive hit – these bad boys have a huge range of 110km’s on a single charge. We had four electrics running on a small 5km circuit and the batteries were completely drained after the 1st day – that’s mad Ted, mad I tell ye!! Clear proof that whether you love ‘em or hate ‘em, electric bikes are definitely the future. If you’re young and able the electric fatty makes you feel like Thor on Redbull. If you’re injured, unfit or feeble then you feel like, well, Thor on Redbull as well. I personally particularly loved having the bike rack with cooler compartment – NOTHING beats a big fat ride, (get your t-shirt here) particularly when there’s an ice cold beverage to be had at the top of a mountain! If you are by any small chance fat curious, check out one of our previous blogs on the topic here. Please feel free to contact us with any questions, anytime. Last but by no means least, special credit and applause to 53 Degrees North, Columbia Clothing and event organizer Ben Finnegan. Take a bow Ben! Suffice to say we can’t wait to do this again next year – yourself and your team have been a pleasure to work with. This competition has been a great boost for the much needed publicity that all start-up’s need in earnest. Big thanks to the Wicklow Enterprise Centre and congratulations on their 21st anniversary. 21 Years of help & support to local business is a vital contribution to the residents of County Wicklow and no small feat. Massive Congratulations to Wicklow Brewery for taking 1st prize today in Wicklow’s Brightest Startup Company 2016 – Competition Results. Wicklow Enterprise Centre winner 2016. Special thanks also to the local Wicklow News for the additional newspaper publicity. Check out the full article on all of the very worthy competitors here. Craft beer and micro breweries are on increase in Ireland, new craft beer labels are appearing out of the woodwork and beer drinkers the world over are rediscovering their taste buds. County Wicklow just happens to be home to three world class micro breweries all of whom (Wicklow Brewery, O’Brother Brewery, Wicklow Wolf) are punching way above their weight on the international beer scene. Ireland has no less than 20 microbreweries on it’s East coast. True Story! If you don’t believe me then count them on this here map. It is my sincere hope that Ireland takes a leaf from it’s closest neighbor and that something on parr with the Campaign for Real Ale (CAMRA) develops/starts in Ireland. What is CAMRA and how does it work I hear you ask? It works like so; locals and visitors are encouraged to Drink Responsibly and are equally encouraged to support their local business’s by collecting stamps for every pint of craft beer imbibed at their local watering hole, kinda like getting a free cup of coffee with every 6 cups purchased, except this time it’s not coffee, and hey, let’s not kid, ALOT more fun! A jolly fine concept indeed! If you’re the type who likes to mix his/her pint of handmade guilt free micro crafty loveliness with a naughty dash of healthy exercise i.e. some super fun relaxed off road cycling on an all terrain omniterra monster 2 wheeled truck a.k.a. A fatbike! Then look no further, Fatbike Adventures have teamed up with Wicklow Brewery, Wicklow’s Historic Gaol and Morton’s Coaches and just so happen to offer 2 beautifully tailored fatbiking beer tasting tours. Each tour includes some of the following quintessentially Irish sites Glendalough & the world famous St Kevin’s Monastic site, Wicklow’s Historical Gaol, Wicklow Brewery, Avoca Handweavers and last but not least the mythical Motte Stone. Read more about and book your tour tickets operating daily from Dublin here . 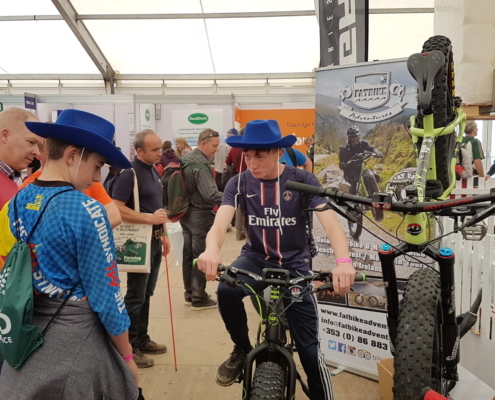 Fatbikes & Farming – Improve Your Fitness at Work – Fatbike Adventures were stoked to be selected to exhibit at the Enterprise Ireland’s Innovation Arena for the National Ploughing Championships 2017. We wanted to exhibit at the National Ploughing Champioships because it is the largest outdoor show in Europe with staggering attendances of nearly 300,000 visitors over 3 days, this show has to be seen to be believed. We were gobsmacked by the sheer scale of it all. We also decided to go due to recent purchases of our Switzz eFatbike 3.0 electric fatbikes all from local farmers here in County Wicklow. These farming customers had chosen to to buy themselves a fatbike to; not only get around their farms, but also to work on & improve their personal fitness levels. 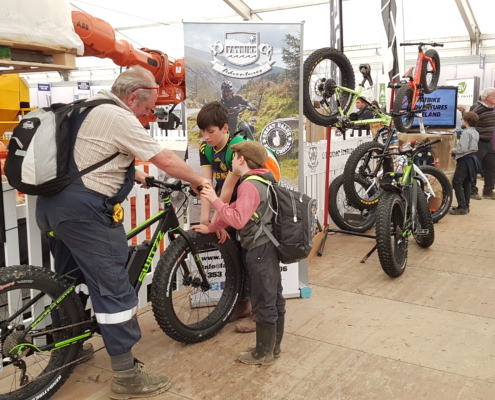 This practical side to the electric bike is in itself innovative and it is also being viewed by many people as a far safer alternative to the quad-bike. We had to meet more farmers and spread the word, no question. There are a whole bunch of other reasons why fatbikes are awesome and if you are reading this, then you are probably ‘Fat Curious’ it’d be worth reading more about those reasons here. Farms in Ireland tend to get a fair bit of rain, (just ask Ophelia and Brian) generally tend to have alot of soft and boggy ground. All farmers need to get around the farm tending to crops and livestock while going about their day and they need to do this quickly, cheaply and easily. . .
Fatbikes love soft ground, need no tax, no insurance and no NCT and they cost a fraction of the price of a 4×4, a tractor or a quad bike. Farm safety is a huge issue in Ireland and quad-bike accidents are responsible for many tragic accidents each year. Quad-bikes, tractors and 4×4’s certainly don’t do anything for anyone’s fitness at work. Fatbikes are not only lighter than quad-bikes, they are also cheaper to run, super environmentally friendly and healthy. Fit enough to ride a bicycle on a beach? Why do Crossfitters work so hard to get fit? What’s it’s all for? Does anyone who goes to Crossfit actually do any activity outside of the crossfit gym setting? That’s where Fatbike Adventures really made an instant impression. . .The FSM Crossfitters definitely felt that they were fit enough to ride bicycles on a beach and were up for a very unique beach challenge? Talk about an action packed weekend, on Saturday this bunch of feisty crossfitters from FSM in Bray who bravely decided to test their hard earned fitness and biking skills riding 20km’s along the beach on the Murrough from Wicklow Town to Greystones. There was a sweet breeze behind us and these guys made it look like plain sailing. So were they fit enough to ride a bicycle on a beach? There is a common misconception that people have on riding mountain bikes versus riding road bikes i.e. they tend to lump them into the same genre and activity, and, in reality, no two disciplines in what is essentially the same sport could be more different. Allow me to explain; road biking involves long hours in the saddle riding vast distances primarily in the same body position using mainly the leg muscles. Roads are generally smooth and (punctures and technical issues aside) the only real challenges are uphills, wind and saddle induced rear-end numbness. Off road or mountain biking involves a broad mix of terrain; rocks, grass, sand, mud, bog, roots, slopes and uphill technical climbs that have the rider standing up, sitting down, moving the bike around and pretty much constantly changing their body position to ‘attack’ the terrain without loosing their balance or flying over the handlebars. The muscles used in addition to the legs are the arms, shoulders, back and abdominal core muscles. I’m not saying that these are not used used on a road bike, of course they are, but, to a far far lesser degree. Another key difference is that the off road cyclist is almost always constantly having to peddle, whilst on the road those lovely long downhill stretches on smooth tarmac are great for a bit of respite. There ain’t no such luxury on a beach, mountain, bog or forest terrain. Great fun was had by all. We hope this becomes a regular fixture and who knows maybe we tackle some mountainous terrain on the next one!?! If you think you are fit enough to ride a bicycle on a beach check our tours out. https://fatbikeadventures.ie/wp-content/uploads/2017/11/blog-how-old.jpg 321 845 Sean https://fatbikeadventures.ie/wp-content/uploads/2017/11/FBA-Logo-banner-White-300x183.png Sean2017-11-22 17:04:592019-01-13 11:52:12Fit enough to ride a bicycle on a beach? Fatbiking – Beaches – Beer – Burgers – What’s Missing? FRIENDS – Because who would you rather be on a beach with whilst drinking beer and riding bikes and eating burgers?? That fantastic ‘friend’ word dear reader is the equilibrium to a balanced, well rounded and totally awesome day out. True story. Earlier this week Outsider Magazine were kind enough to feature Fatbike Adventures in their regular Tuesday slot on Today FM with Matt Cooper for St Valentines Day. Give the podcast a listen here. You and your friends simply need to decide on a day to take yourselves to a beach, add some fatbikes, give yourselves a little challenge to cover some distance and earn a well deserved reward, simples. That reward is a Phil Healys Pub gourmet burger with an ice cold craft Franciscan Well beer and voila! Skadoooooosh! You have a finely tuned mathematically sound, completely perfect day trip from Dublin with your mates. We say why limit yourself to Valentines Day or any day for that matter, ANY DAY IS A GOOD DAY TO RIDE BIKES AND DRINK BEER PEOPLE! That said any day is a good day to be romantic or the perfect day trip from Dublin and escape from city life. Peace! https://fatbikeadventures.ie/wp-content/uploads/2017/11/Screen-Shot-2016-05-23-at-11.00.20-845x684.png 684 845 Sean https://fatbikeadventures.ie/wp-content/uploads/2017/11/FBA-Logo-banner-White-300x183.png Sean2017-11-22 16:58:402019-01-13 11:48:47Fatbiking - Beaches - Beer - Burgers - What's Missing?